Have you gotten sick of me talking about how much we liked customizing our stock cabinetry? I hope not because today I’m sharing how the inside of the drawers, doors and pantry were transformed with a few key organizational pieces. After being without a kitchen for months getting our kitchen belongings unpacked and cleaned from being stored in the front entry way closet felt so good. Finding everything the most practical place in the kitchen was important to do right away. We didn’t want to rush to put things away without really considering how we’d use each drawer and cabinet. One of the first things we did was add soft close hardware to the inside of the doors. It was way easier than we anticipated to install them. We didn’t put them on the very top cabinets and it startles me every time I close them. The soft closures immediately made the rest of the cabinets feel (and sound) higher quality. Our old silverware insert didn’t fill the drawer very well and the extra space was too small to be utilized. Getting an expandable cutlery organizer instantly gave me a place to put extra knives and serving ware that didn’t fit with the previous one. Junk drawers are supposed to be messy right? Our junk drawer is extra cramped since the cabinet isn’t very wide. I picked up a few shallow drawer organizers to make it simple to find things. We can easily pull out each container and see everything all at once. There’s never been a good place for food storage containers in any kitchen I’ve ever had. They just never stays organized for very long. Installing these metal pull-out drawers means I can see all of the containers and lids at once without having to dig. This cabinet is right below where we keep the plastic wrap and foil so putting leftover food away is much more streamlined. This dark marble utensil holder was the perfect color and size for the counter next to the stove. Our previous utensil crock clashed with the new countertop and was larger than what we needed. Plus, this new one is really pretty. With the new cabinets and organization in the kitchen, food and cooking items we used to store in the pantry are now inside the kitchen cupboards. This freed up space for the pantry cupboard to become more of a tiny mudroom. We took the tall doors off for easy access from the back stairs and the door into the kitchen. I had been storing cleaning supplies in different rooms and closets of the house. I pared things down to what I really use (thanks Marie Kondo!) and put everything other than liquid cleaners back here (those are under the sink). 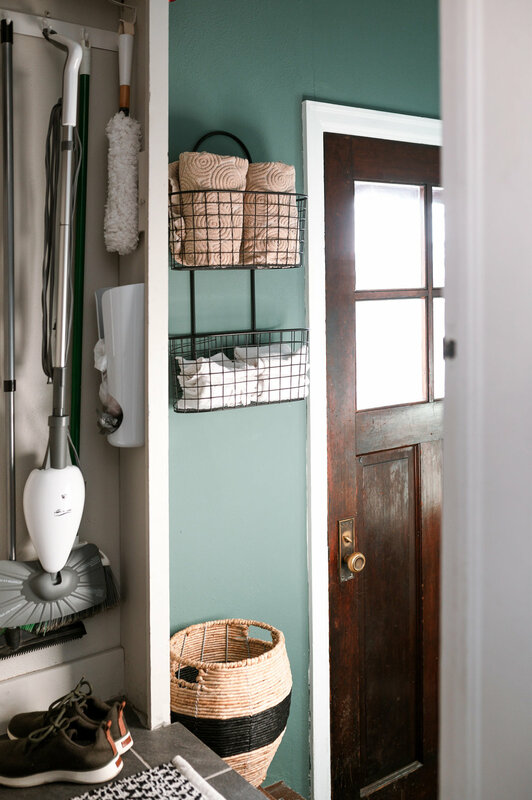 Plastic bag storage, hooks for the mops and brooms and small item storage in bins and baskets made this space go from chaotic pantry to chic cleaning closet. On the other side of the pantry cupboard, I organized all of my floral arranging pieces. Before I had kept vases separate from shears and shears separate from floral tape/wire/food and everything was stored all over the house. I love that once spring comes, I can run out to the backyard and grab a handful of flowers with everything I need in one place right inside the door. The top shelf houses my small vases. I love that the plastic totes have latches on the lids. I can grab them without worrying that the lids aren’t on tight. Two shelves below that are bins with floral spray, floral tape and gardening gloves. In the tall cup I’m keeping wire cutters and garden shears and in the canister I’m storing floral wire and flower food. The bins below that keep things like grilling gear, a set of basic tools, car cleaning supplies, etc. Everything that we use in the backyard is easily accessible right inside the backdoor. One of my least favorite chores is cleaning off our dog’s feet after each time she goes outside. With how tight the steps are, getting to a rag and then getting her to stand in a place that I can reach her paws feels like musical chairs. Putting up this wire basket storage unit for small rags within arms reach right inside the door has already been super helpful. The large towels are for when it’s raining and she needs a full body dry off. The color-blocked basket below is the perfect spot to keep dirty towels and rags from daily housekeeping and Mae’s trips outside so they are collected in one spot before getting to the washer. 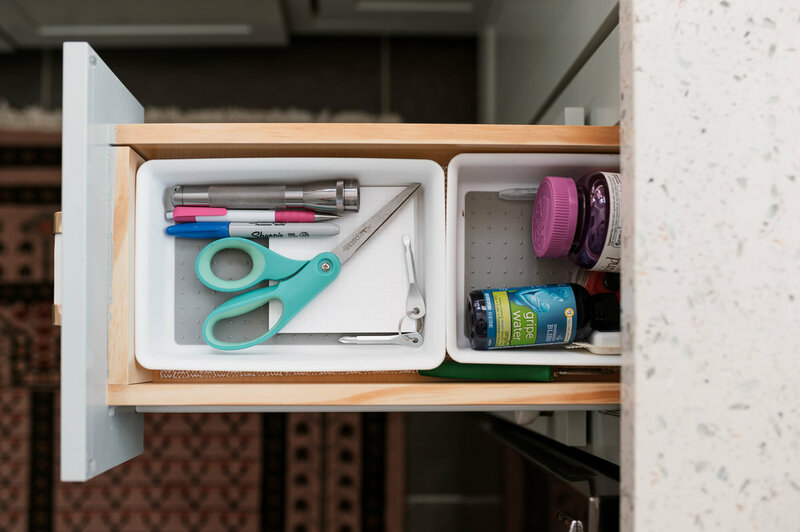 This pull out drawer was one of the easiest things to install in the whole kitchen. I thought the process was going to be more intense but the unit comes out of the box fully assembled and all I had to do was to secure it to the bottom of the cabinet with 4 screws. These skillets definitely could use some scrubbing with steel wool but now that they’re easier to get to, that might actually happen. The last piece I added was this sponge caddy. It’s actually meant to be a set of tip out trays to go inside the top panel of the sink cabinet. It comes with hinges to make that panel open up but after the product came, I realized that because of the extra depth of our sink installing it as intended wasn’t going to work. Instead I attached 3M strips to the back of one of the caddies and placed it inside the cabinet door. 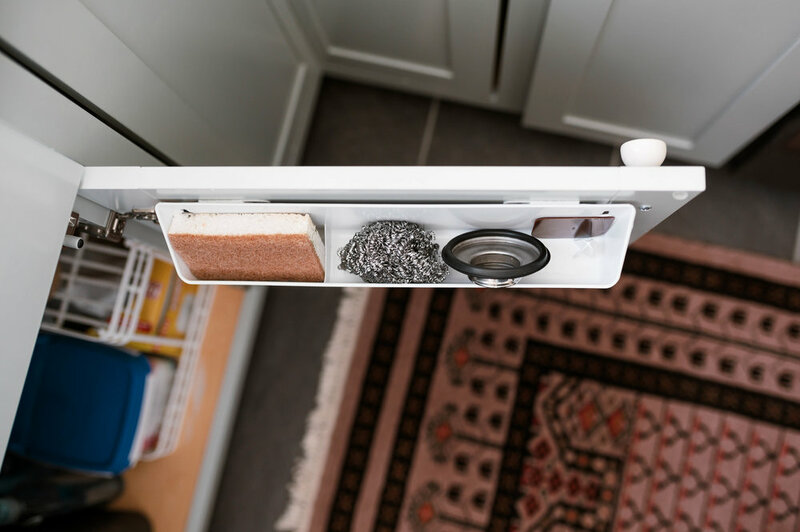 It’s maybe not how it was designed to be used but it works really well for us and keeps the countertop free from clutter. After adding all of these pieces, I feel equipped to keep the kitchen clean and organized with a place for everything. 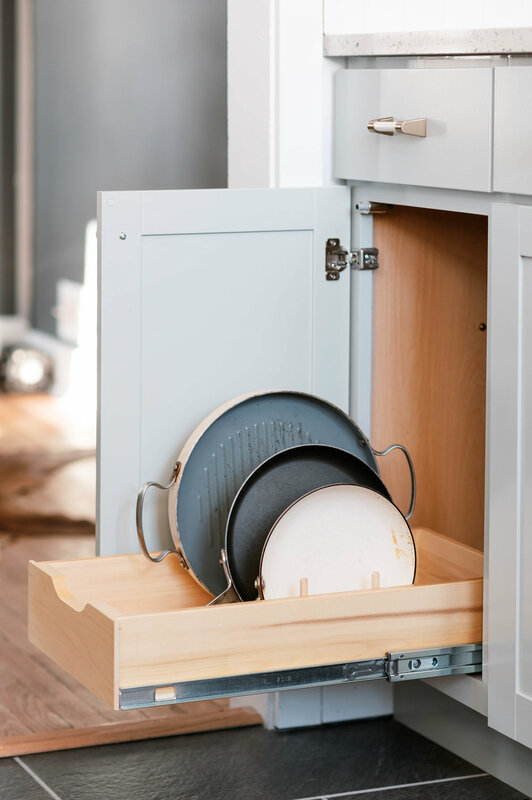 What are your kitchen storage or cleaning closet hacks?